For the first time in decades, the MSU Homecoming Parade will march through Downtown Mankato to celebrate the 150th (Sesquicentennial) Year of Minnesota State University, Mankato. More than 100 units will participate in this year’s parade making the largest one in recent history. The route begins at the corner of South Broad Street and East Liberty. It will meander down Broad, Cherry, Second, and Main Streets before turning onto Riverfront drive and ending at East Rock Street. The best place to watch the parade will be on South Broad Street between East Liberty and East Cherry. The second-best place is in South Second Street between East Cherry and East Main. 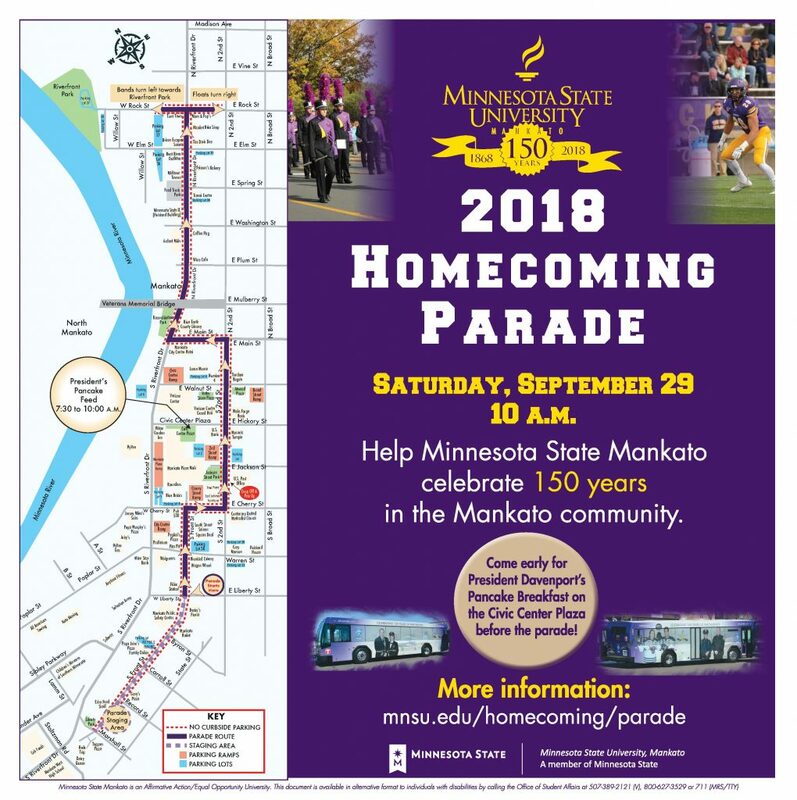 The City of Mankato will provide specific Homecoming shuttles for students and other community members from campus to downtown the morning of the parade. Look for purple wrapped sesquicentennial University buses for transportation from campus to the parade. Buses start their routes at 7 a.m. and additional buses will be added after 8 a.m. and will make trips every seven minutes up until 2 p.m. Buses will run from the Nelson Hall Bus Bench and the McElroy Bus Shelter to a temporary transit hub in the 600 block of Broad Street in downtown Mankato. Students will depart near the St. Johns Baptist Catholic Church, just two blocks from the parade route on South Front Street. The free President’s Pancake Breakfast (7:30 a.m.-10 a.m.) will be four blocks away near the Civic Center Plaza by the Verizon Wireless Center. For parade participants, if you’re not using the shuttle buses, park in the Mankato West High Parking Lot. At the end of the parade, the City of Mankato will start shuttling parade participants near the termination of the route at East Rock Street back to the West High Parking Lot. The estimated frequency for this shuttle is 20 minutes depending on traffic.